CHICAGO--(BUSINESS WIRE)-- Hyatt Hotels Corporation (NYSE: H) announced today the opening of the first Park Hyatt hotel in the Caribbean, Park Hyatt St. Kitts Christophe Harbour. Set within Christophe Harbour, the 126-room luxury resort spans the secluded beach of Banana Bay at the foot of St. Kitts’ lush rolling hills and offers unobstructed views of the Caribbean Sea and neighboring Nevis. Offering a wellness sanctuary for restorative peace, the resort is also unveiling the first Miraval Life in Balance Spa in the Caribbean. Home to three signature restaurants, indoor and outdoor event spaces, two pools, and other distinct amenities, Park Hyatt St. Kitts Christophe Harbour offers guests a journey of rare and intimate experiences. All 78 rooms and 48 suites are sustainably and thoughtfully designed by Range Developments, incorporating local materials and seamlessly intertwining contemporary architecture with colonial design. 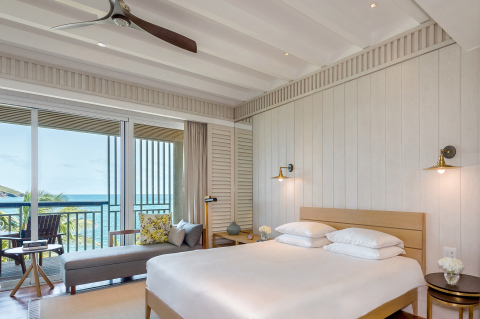 Each room’s chic, Kittitian-inspired décor showcases views of the Caribbean Sea and the islands beyond, with luxurious touches of peerless quality such as private balconies and terraces, rain-showers and deep soaking tubs. For the ultimate indulgence, the three-bedroom Presidential Villa is equipped with a private infinity pool, wellness area, personal butler and private chef. Dining experiences offer exceptional local and international cuisine. Fisherman’s Village serves ocean-to-table lunch and dinner overlooking the water. For a more intimate dining experience, guests can indulge in The Stone Barn adults-only restaurant. The Great House, reflective of a grand colonial home, offers all-day dining, a Rum Bar, herb garden, chef’s table and a conservatory serving plantation afternoon tea. Park Hyatt St. Kitts Christophe Harbour features both indoor and outdoor private event spaces, suitable for incentive groups, weddings and social functions. The two lush private event lawns enjoy uninterrupted views of Banana Bay and the neighboring island of Nevis. Events were traditionally held in residences on the island and the resort’s Reception Hall houses seven chic indoor event spaces. Multiple locations allow the resort’s event specialists to create diverse functions and give event planners peace of mind with dedicated spaces. The idyllic resort location offers a romantic setting for wedding ceremonies and functions. The Beachfront Lawn or the private Terraces are beautiful locations for ceremonies and receptions. There are numerous locations for photography, including the golden sandy beach and rolling hills behind the resort, both providing stunning backdrops. Miraval Life in Balance Spa at Park Hyatt St. Kitts Christophe Harbour brings Miraval’s award-winning spa services to the luxury resort. With therapies that honor nature and the mind-body-spirit connection, guests can cleanse, heal and nourish their bodies and minds in this 37,752-square-foot state-of-the-art oasis. The spa entrance and reception area provide a view of Mount Nevis and also overlook the Rampart Pool and The Narrows – the majestic straight separating St. Kitts from its sister island Nevis. The spa’s design features natural stone walls with nine treatment rooms, including three couples’ treatment rooms complete with heated private plunge pools and outdoor showers. Guests can take advantage of the 24-hour, 1,750 square-foot fitness center at The Sugar Mill, which is also home to yoga and meditation experiences. After a day filled with relaxing spa treatments and dynamic wellness activities, guests are welcome to enjoy the Miraval signature tea, made with a fusion of rejuvenating local herbs such as lemongrass, basil and thyme. To encourage guests’ island immersion, Park Hyatt St. Kitts Christophe Harbour offers a series of enriching “journeys” that have been carefully curated to introduce guests to the history, culture and people of the Federation, which until 2005 had sugar production as its dominant industry. True to the Park Hyatt brand’s commitment to bring rare and intimate experiences to travelers, the itinerary for each immersive journey features local activities and interactions with interesting personalities. From walks with an island historian and rainforest excursions, to visiting the UNESCO Brimstone Hill Fortress that was elemental in Caribbean history. For the resort’s youngest guests, The Island Fort by Camp Hyatt offers educational activities and an introduction to the culture of St. Kitts and Nevis. Park Hyatt hotels provide discerning, affluent business and leisure guests with elegant and luxurious accommodations. Guests of Park Hyatt hotels receive highly attentive personal service in an intimate environment. Located in several of the world's premier destinations, each Park Hyatt hotel is custom designed to combine sophistication with a distinctive regional character. Park Hyatt hotels feature well-appointed guestrooms, meeting and special event spaces for groups, critically acclaimed art, food and beverage program, and signature restaurants featuring award-winning chefs. There are currently 41 Park Hyatt hotels in the following locations: Abu Dhabi, Bangkok, Beaver Creek, Beijing, Buenos Aires, Busan, Canberra, Changbaishan, Carlsbad, Chennai, Chicago, Dubai, Goa, Guangzhou, Hamburg, Hangzhou, Hyderabad, Istanbul, Jeddah, Maldives, Mallorca, Melbourne, Mendoza, Milan, Moscow, New York, Ningbo, Paris, Saigon, Sanya, Seoul, Shanghai, Siem Reap, St. Kitts, Sydney, Tokyo, Toronto, Vienna, Washington, D.C., Zanzibar and Zurich. For more information, please visit parkhyatt.com. Follow @ParkHyatt on Facebook, Twitter and Instagram, and tag photos with #LuxuryIsPersonal. Miraval Group is a global leader in wellness resorts and spas. Miraval Arizona Resort & Spa in Tucson pioneered the destination wellness spa resort category with its comprehensive program of activities, experiences and personal treatments. A Miraval Life in Balance Spa opened in April 2016 at Monarch Beach Resort in Dana Point, CA.